Greenery is the name of the fresh and vibrant new shade made by Pantone for this year. It is a truly Irish colour, symbolic of the undulating hills, the grazing land and dramatic landscapes of the Emerald Isle. Foliage and botanical patterns are very much on trend at present and are reminiscent of William Morris’ textile and wallpaper patterns. 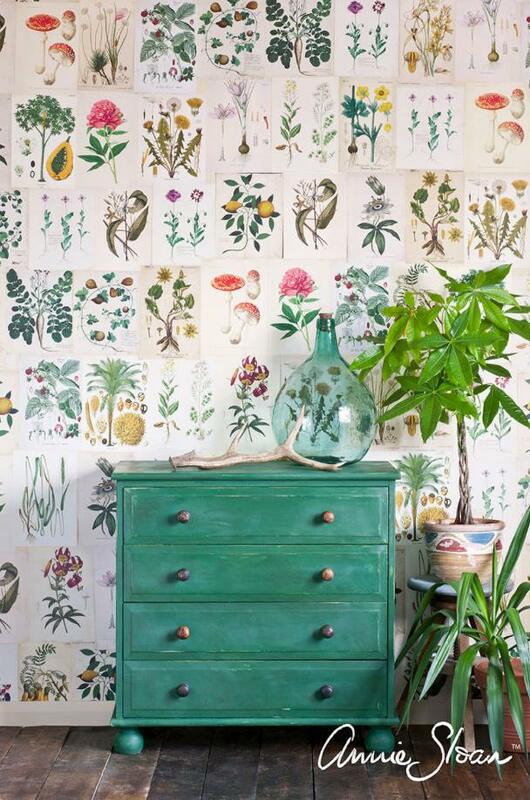 Greenery shades are revitalising and make me yearn for nature’s imminent revival in springtime. Being aware of the natural world, and being conscious of sustainability, another useful trend is the idea of ‘upcycling’. This is a great way to reuse materials and reduce our collective carbon footprint. Using Annie Sloan Chalk Paint, did you know that here in Handmade Design Studio we can refresh and redesign any item of furniture for you? We discuss the ideas for the style you like, the colour and finishing and you will be guaranteed to have a unique, individual hand-painted piece that breathes new life into your existing furniture and doesn’t ‘cost the Earth’ in every sense of that expression!